Ballpoint There are 36 products. Personalized pens are an excellent promotional product due to their high visibility and affordability, and these customized ballpoint pens from Sutter’s Mill Specialties are the best of the best. We have a large selection of different styles and colors of ballpoint pens featuring both click and twist action operation, including carbon fiber, laser pointer, gel ink, and stylus pens – all imprinted with our state-of-the-art laser engraving process. This colorful personalized pen blends comfort, style, and affordability into one sleek writing tool. This pen features sleek chrome accents on black, and a stylus cap with a magnetic closing mechanism. 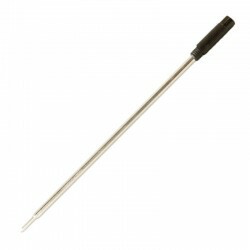 This twist-action ballpoint pen has a large space on the upper barrel for a custom-imprinted logo. 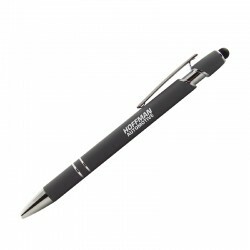 With a slim design and sharp chrome and black accents, this personalized ballpoint pen is the ideal promotional item. 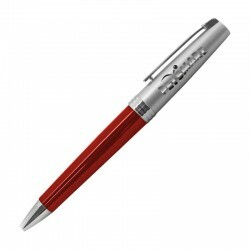 Catch eyes with this bold colored, personalized ballpoint pen. This stylish, click action ballpoint pen features black accents and finish to really make your logo stand out. 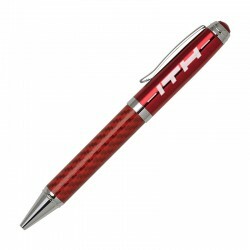 This executive pen was designed to epitomize luxury, and is finished in high-strength carbon fiber in a variety of bold colors. These Parker compatible ink refills are available in blue or black. This sleek stylus twist-action ballpoint pen belongs at every desk and in every travel case. This colorful, personalized pen is the perfect size to take along wherever you go.